Deep in the mines, there is a little leprechaun digging for gold. But unfortunately this little friend likes ale more than work, so the gnome always tries to get him drunk to get all the gold for free. Deliver the gold to the gnome, but avoid meeting him. You can empty the cart by pushing it, but be careful, the little leprechaun walk towards the next wall without stopping, so plan your steps carefully and find the best way. Will you manage to deliver all the gold without getting drunk? Deliver the gold to the gnome, but avoid meeting him. You can empty the cart by pushing it, but be careful, the little leprechaun walk towards the next wall without stopping, so plan your steps carefully and find the best way. 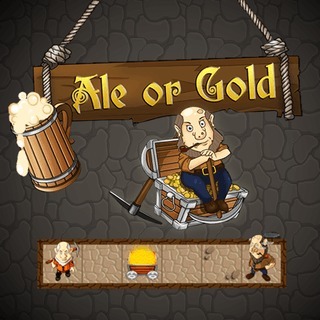 Will you manage to deliver all the gold without getting drunk?